Des Knaben Wunderhorn is an extensive collection of Romantic poetry, published by Achim von Arnim (1781-1831) and Clemens Brentano (1778-1842). The idea came to them while taking a boat trip along the Rhine, during which the wine flowed freely and spirits were high. Gustav Mahler was immediately attracted to Des Knaben Wunderhorn, so it is not surprising that he used so many of the poems in his Lieder: between 1887 and 1902 he composed twenty-four songs based on texts from the anthology. The composer himself uses the term “Humoresken”. However, and that is the crux of the matter, none of these songs is truly carefree and humourous. Moreover, when humour threatens, there is always a snag. This is even the case in Rheinlegendchen with its seemingly lighthearted Ländler-like charm, also to be found for instance in Verlorne Müh. Essentially the story is about a person longing to find true love. Reading between the lines, one can only conclude that the projected events of Rheinlegendchen will forever remain a dream. 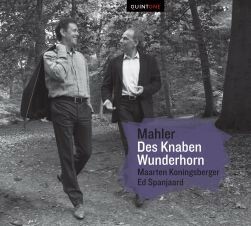 Like Mahler’s other works, Des Knaben Wunderhorn is mainly concerned with the tension between the ideal and reality, more specifically the human striving towards the unattainable, against overwhelming odds; trying to find the sense in the struggle, but seldom succeeding. The anti-hero is fighting powers against which one can not, or rarely, prevail. Maarten Koningsberger is one of the leading baritones in The Netherlands. His diversity of styles is reflected in his song recitals, with pianists as Graham Johnson and Rudolf Jansen or with lutenist Fred Jacobs. His concert tours include Europe, South Africa, the Far East, China, Israel, USA and Canada, always highly acclaimed by the press. Among the many mayor concerthalls where he performed are: The Concertgebouw Amsterdam, Wigmore Hall London, Philharmonie München, Carnegie Hall New York, Theater an der Wien, Staatsoper Berlin, Salle Pleyel Paris, Romanian Atheneum Bucharest, Amsterdam Operahouse, Esplanade Singapore and many more. Ed Spanjaard was music director of the Limburg Symphony Orchestra, Maastricht (untill end of the season 2012) as well as the Nieuw Ensemble (Amsterdam), which specializes in contemporary music. Additionally he is a regular guest conductor of the Royal Concertgebouw Orchestra, the orchestras of the Dutch Radio and the Netherlands Chamber Choir.